Believe it or not, an awful lot of people still buy CDs. When digital music purchases surpassed physical music sales in 2011, one would have thought that the world had forever changed and no-one was buying CDs anymore. Then it was all about on-demand music services like Spotify, Rdio, Beats Music and Google Play’s All Access. When it was reported that digital music sales dropped in 2013, many thought this was the beginning of the end of digital music sales. Looking at the International Federation of the Phonographic Industry’s annual Digital Music Report for 2013, physical format music sales still account for 51 percent of revenue whereas digital revenues, which includes both purchased and on-demand subscriptions, account for only 39 percent worldwide. Digitizing CDs – When preserving the highest quality music possible is important to you, consider using X Lossless Decoder for Mac, or XLD as it is often referred to. XLD supports both FLAC and Apple Lossless formats and has the ability to output a binary CD image with cue sheet. The equivalent on Windows is Exact Audio Copy (EAC), which is also free. Both tools utilize AccurateRip to compare the digitized results of your music files to the output that others have created in order to ensure the most accurate and consistent rip possible. Improving album information – Sometimes the album information associated with your music files is not what you want it to be. While iTunes for both Mac and Windows can get edit your music information, I have found TuneUp ($49.95), which also has a Mac and Windows version, to be a great assistant when cleaning up my music library’s album information. Finding album art – Cover Scout, for $29.99 on Mac, can help you find missing album art as well as upgrade your existing album art to a higher resolution image. On Windows you can use the free version of Album Art Downloader to increase the quality of your music files’ album art. Renaming music files – Maintaining a sensible structure to your digitized library will make managing your files that much easier. PublicSpace’s A Better Finder Rename ($19.95) for both Mac and Windows will allow you to set your own rules to rename your music files based on the embedded album information. Finding duplicates – It happens to the best of us; when managing thousand of music files, you are bound to have a duplicate song here and there. MacPaw’s Gemini ($9.99) for Mac and Hardcodes Software’s dupeGuru Music Edition (Free) for Windows will help locate and eliminate your duplicates. Once your CD collection is digitized you will have to choose which cloud based music library to use. The traditional cloud based options include Apple’s iTunes Match, Google Play Music, and Amazon Cloud Player. Then there are also personal cloud options like Synology Disk Station Manager’s Audio Station that also allow you to access your digitized music library from anywhere on the internet. 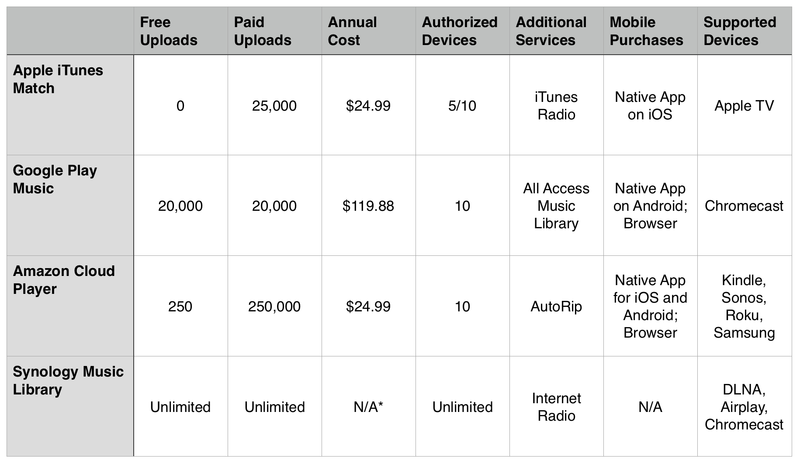 Google’s All Access service is the most expensive of the three subscription based services at $9.99 each month. All Access is an on-demand service like Spotify, giving you instant access to millions of songs. You do not have to use this service to store your music online. You can still upload 20,000 songs to your Google Play music library, for free. With a relatively small amount of free storage to start out with, Amazon Cloud Player gives you space for only 250 songs for free. Upgrading to the Premium edition for just $24.99 a year will let you upload 250,000 songs. Apple on the other hand will only store your iTunes purchases in iCloud for free. Upgrading to iTunes Match for $24.99 a year will allow you to upload 25,000 additional songs. Synology’s Audio Station does not have any subscription pricing nor any limits to the amount of music you can store. You do have to buy the network attached storage device which will cost anywhere from $150 for a budget friendly one-bay device, up to $600 for a business class four-bay device. You will need to supply your own hard drives when purchasing the diskless versions of each product. Selling only digital music, iTunes has pretty much remained the same since it first opened up back in 2003. The experience has become a bit crowded over the years as Apple has added Movies, TV, Shows, Audio Books, Books, Podcasts, iTunes U and of course Apps to the same simple interface. Like Apple, Google’s Music Store also sells digital music only. On iOS the web-based access you have to go through to buy music from Google is hardly worth the effort. Amazon does sell both physical CDs as well as digital music. Just like purchases of digital music from Amazon’s MP3 store, any physical CD that you comes with Amazon’s AutoRip feature does not count towards your storage limit. AutoRip is available on certain physical CD purchases through Amazon and will automatically add the MP3 version of your album to your music library before the physical CD even ships. As you add music to your iTunes music library, iTunes Match will scan your music files and attempt to match it to music that Apple already has stored in their catalog. Once matched, Apple will upgrade your music to a higher quality 256kbps version of the song. Uploading music to your Google Play library is accomplished by downloading and installing Google’s Music Manager app. This app will only allow you to upload and download your music files. Similar to Google, Amazon has its own Amazon Music Importer that you use to upload your music files. With Synology you can mount the device as a drive on Windows or Mac and just copy your music files over to the music folder on the device. Initial setup is a bit involved, but once you have everything set up, your transfer speeds on your local network will be much faster than your upload speeds over the internet. Apple of course ships its own iTunes music app with every iOS device that can play music from iTunes Match library. Google has its Google Play Music (Free, iPhone), Amazon has its Amazon Cloud Player (Free, Universal, and Synology has their DS audio (Free, Universal) app. For the most part, all four music players have very similar capabilities. They can each sort your music by Artist, Album, Song or Genre, they all support Playlists playback, and they all can search for music in your cloud library for you to stream or download. Google is the only one that does not have a native iOS app for the iPad. gMusic 2 ($1.99, Universal) can rectify this omission and is a pretty decent replacement for Google’s own iOS music app. All four of the iOS apps can stream music directly from the device to either a Bluetooth enable speaker or an Airplay enabled device and they each support playing music in the background. Snology can stream musicdirectly to one or more Airplay, DLNA or Chromecast devices. You can even remotely control your home music system from anywhere on the internet. With Apple’s Remote app for iTunes, you can play music stored on a computer running iTunes Home Sharingover any Airplay enabled device. In order to stream music directly from a iTunes Match library to an Airplay device, you will need an Apple TV. This is similar to playing your Google Play library directly on Chromecast or your Amazon Cloud library directly on Fire TV. For most people, Google’s free storage of 20,000 music files will be more than enough space to store you music library online. When it comes to buying new music, simply use Amazon and buy physical CDs that qualify for AutoRip and upload them to Google Play. When it comes to playing your music you can always sync your Google or Amazon library and automatically add songs to iTunes on your computer. That way you can take advantage of any Apple TV, Airport Express and any Airplay enabled speakers or audio components you may have. If you have a really large music library, use either Amazon and store 250,000 songs online, or you buy a Synology device. Just keep in mind how long it will take you to upload 250,000 music files to Amazon. Not only will Synology be faster on the uploads, but its ability to play back on AirPlay, DLNA and Chromecast is a major plus. Nobody has mentioned Plex… it’s free, and will stream to any of your devices. I use it for mobile playback of movies, music, internet content and I think it does pictures and syncs your videos. The iPhone app costs 5 dollars, but, believe me… It’s totally worth it to have your entire collection in your hand. For those that do not want to pay for the app… you can go to plex.tv/web. It’s not as snappy as the app, but it does the job. The only thing that I’ve really noticed is that sometimes the quality willl suffer. And you have to leave your home pc on, obviously, because thats now your “cloud”. When you’re at home, you can either use a chromecast (when it works), or any DLNA device (playstation, xbox, roku, whatevs) to enjoy your things. They give you 15GB of free space – 20GB if you sign up via this link: https://copy.com?r=9IfWjn – with a further 2GB for linking to your twitter account. Basically you start with 22GB and have the ability to earn a further 5GB of free space per referral. The interface is clean, the program works wonderfully, very fast, supports Wifi Sync and AES256 encryption, and they seem to have a client for just about everything (Mac, Windows, Linux, iOS and Android). Just as a point of reference, the approximately 10,000 songs that I have uploaded to Google Play take up a little over 70GB on my Synology drive. I have noticed that on average, 128K MP3 songs take up 7GB per 1,000 songs, 192K MP3 is 10GB, AAC 256 is 15GB and Apple Lossless is about 43GB per 1,000 songs. That being said, Google is giving away at least the equivalent of 135GB for 20,000 songs encoded at 128K MP3. GPMAA also lets you stream to Sonos now. Actually, storing your music to Google Music is free. You don’t pay until you sign up for All Access, which is the all you can eat listening service. I think this should be fixed. I do mention that fact in the article and even recommend using Google for music libraries smaller than 20,000 songs, for free. On the chart there is a free uploads and a paid uploads column, which remains the same number for Google whether you upgrade to the paid service or not. iTunes Match correction… You are not uploading anything to apple. The assumption of the service is that within their millions of songs, they will already have yours. Only in the very unlikely occurrence that you do have a song that is not in their library, then you will upload it. Over the years of using the iTunes Match service, I believe that it has the most difficulty with low bitrate digital music files and low, variable bitrate music files. If you can get all of your music to match, I would definitely recommend that you download the higher bitrate version and back that up somewhere. I have also experienced songs and albums dissapearing from my online music library for both Apple and Amazon (I don’t buy enough music from Google, but expect I would notice a similar behavior over long periods of time). From time to time, each online music service renegotiates their contracts with various labels, and there are some albums that are either removed, or added back to the services catalog under a different catalog number. When this happens, the same songs and albums will likely be removed from your library as well. While I did not elaborate on that fact in this article, it is one reason that I have altered my online music purchasing habits to look for AutoRip albums on Amazon first. That way I get both the MP3 version of the album in addition to the physical CD. I have a stack of shrink-wrapped CDs that have never been opened because I already have the MP3 version in my online music library. What about Style Jukebox Cloud Player?